Product prices and availability are accurate as of 2019-04-18 06:32:02 BST and are subject to change. Any price and availability information displayed on http://www.amazon.co.uk/ at the time of purchase will apply to the purchase of this product. A warm welcome from a wild sea. Made by the sea. Talisker Storm is a truly tempestuous Single Malt. No whisky reveals the character of its birthplace better than Talisker To know Talisker is to feel the power of the sea, and sense its rugged location on the banks of Loch Harport, on the foreboding Isle of Skye. 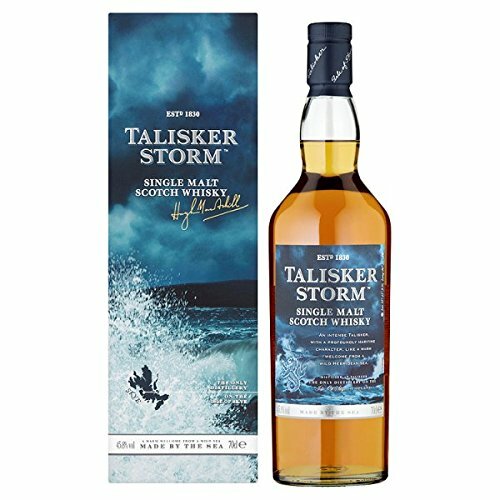 "Talisker Storm" takes this most intense of experiences to a new level. The sweet warmth and briny, peppery finish that are the symbol of the Talisker character have been carefully accentuated through a skilful blend of differing ages Talisker casks. The profound maritime character achieves a deeper intensity, like a warm welcome form a wild Hebridean sea.